NEW YORK—Forgiving past hurts and moving forward is often easier said than done, especially when the reason for your pain is still right in front of you. 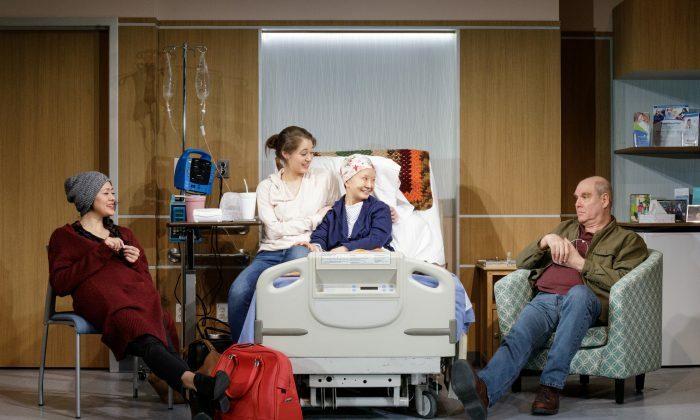 Playwright Leah Nanako Winkler makes this point clear in her involving comedic drama “God Said This,” presented by Primary Stages at the Cherry Lane Theatre. Hiro (Satomi Blair) is a 30-something New Yorker who left her childhood home of Lexington, Kentucky, long ago. Her memories of that time are colored by her father’s alcoholism and her mom’s efforts to shield her children from the worst of the turmoil. Family obligations, however, have forced Hiro to return to the one place she’d rather not be. Her mom Masako (Ako) is recovering from surgery and is now undergoing a strenuous round of chemotherapy as an in-patient at a Lexington cancer center. Also present at Masako’s bedside are Hiro’s younger sister Sophie (Emma Kikue), who is a born-again Christian, and their dad James (Jay Patterson), now a very committed member of Alcoholics Anonymous (AA). While the rest of the family has seemingly come to terms with what happened years before, Hiro is not yet ready to be so understanding. As Hiro tries to sort out her still-raw feelings, it falls to Masako and Sophie to play peacemakers, albeit in different ways. Along the way, Hiro gets some unexpected insights from John (Tom Coiner), an old friend from high school, who has had to come to terms with some important issues of his own. Blending family angst with hilarious down-home worlds of wisdom, “God Said This” strikes a poignant cord because none of its characters come off as preachy, pretentious, or having all the answers. Rather, they are shown to be everyday people, just trying to get through the day, even as the world threatens to crash down around them. The play ultimately shows that the most important reason to move on from painful events in the past is to be able to begin a new chapter in your life—even if that proves difficult. This is something James makes quite clear in one of his AA testimonials, when he notes how it’s easy to be a jerk but how it’s hard to be nice. (We don’t need to mention that he uses another word in the play.) This character, who turns out to be the most together person in the story, serves as a sort of unofficial narrator. It falls to the rest of the family to realize that healing is a two-way street, irrespective of whoever may have been initially at fault. While James and Hiro try to deal with their past, Sophie has her own issues to face, as she tries to be perfect for everyone around her. She uses her faith as a way to help others find their own strength, as when telling her mother “what God said.” Yet, each new situation or trauma pushes her closer to the breaking point. Patterson does very well as James. A particularly nice sequence has James recounting how he and Masako first met, while offering a glimpse of the love they initially felt for each other, a connection that has lasted for over 37 years. Patterson shows the character to be someone who has accepted responsibility for the pain he’s caused, has taken a lot of verbal abuse as a result, yet remains emotionally stunted in other ways. Ako is excellent as Masako, the one constant the family could always count on, but whom they now must rally around to help. In fact, the show’s most emotional moments occur when Masako is in her hospital bed, reacting to the massive pain caused by the chemotherapy. Masako’s spasms of pain are particularly gripping when she cries out that her very bones hurt due to the treatment. Ako also shows the harsher side of the character. What angers Masako the most is that James, who himself was in a life-threatening situation due to his drinking, was able to make a full recovery once he stopped. Yet, ironically, Masako, who had always taken care of herself, is now watching her body turn against her. Kikue, though her part is underwritten at times, gets in some good moments as Sophie, a woman trying to balance what seems like the weight of the world on her shoulders. Coiner is wonderful as Hiro’s old friend, a combination comic relief and armchair philosopher. His comments, while not always politically correct, have a caustic ring of truth, especially when he describes how he handled a bad situation of his own. Blair works perfectly Hiro, the returning prodigal child, who learns the importance of healing for both herself and for those around her. Morgan Gould’s direction is letter-perfect as she expertly blends the show’s more traumatic and lighter moments into a cohesive whole. She keeps the story moving forward, with nothing presented feeling out of place or unnecessary. The sets by Arnulfo Maldonado, most notably a hospital room, work well. The lighting work by Ryan Seelig suggests the proper atmosphere for the hospital and other locales as well: places ranging from an AA meeting to a very significant car ride. “God Said This” is an intimate and not-always-gentle tale of people trying to deal with what life brings their way and, hopefully, come out the other side. Hitting all the right notes, it’s definitely worth checking out.